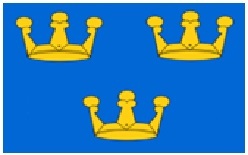 East Anglia’s flag was included on the registry from its inception. The flag combines the Saint George’s cross of England, with a shield bearing the arms ascribed by mediaeval heralds to the Anglo Saxon Kingdom of East Anglia and the Wuffingas dynasty which ruled it, three golden crowns on a blue background. The arms are effectively identical to the small arms of Sweden from where the Wuffingas are held to have originated. The archaeological discoveries at Sutton Hoo in Suffolk closely resemble those in southern Sweden both in general form and in details of equipment that the burial contains. 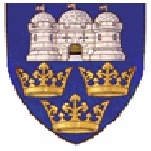 It has therefore been suggested that the mediaeval choice of three gold crowns as the ascribed arms of the ancient kingdom was a purposeful reference to the ancient Scandinavian origin of the ruling East Anglian dynasty and that therefore the arms may have rather an ancient origin. The earliest record of the Swedish arms was in the fourteenth century however, so nothing can be definitively asserted. 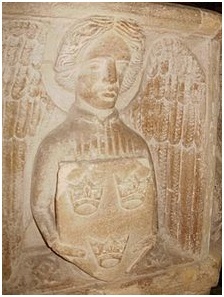 although inexplicably appear there, doubled in number, with six crowns arranged three at the top, two at the centre and one at the base of the shield. again in his “History Of Great Britaine” (also from 1611, reprinted in 1623) and it also appears there in quasi flag or banner form. from the early twentieth century. 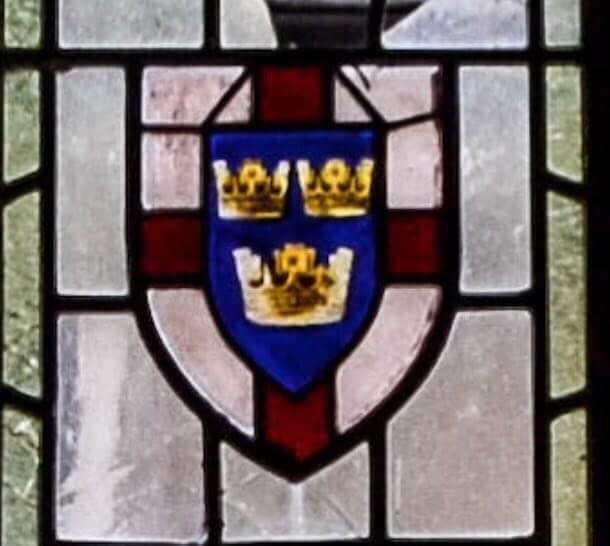 The flag was also to be found, in shield shape, in a stained glass window at the former East Suffolk County Council’s County Hall, in Ipswich, now derelict. on the Essex and Suffolk Fire Office, in Colchester, in neighbouring Essex. 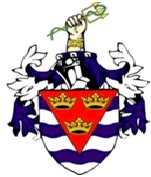 to indicate the Suffolk portion of the company’s remit. 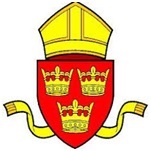 One may speculate as to why a more specific “Suffolk” emblem was not selected but presumably the building being renovated in the era when the East Anglian flag had been adopted, the emblem may have been very much in the local public eye and seemingly the obvious one to depict to indicate an East Anglian territory. of “The East Anglian” rail service which ran from Liverpool Street Station, London, to Norwich. Perhaps the most unusual instance of the East Anglian flag on display however, is its appearance at the celebrations of the 10th anniversary of the occupation of Samoa by the German Empire! where it can be seen on the front façade of the building in the picture, on the second storey, behind the pole bearing another flag; the date being about 1910. Its presence here is something of a mystery! of the ‘Eastern District Licensed Trade Association’ a regional branch of a national organisation, formed in 1888, as the ‘National Trade Defence Fund’, to campaign on behalf of the breweries and licensed trade against the temperance movement and measures to stifle their trade. 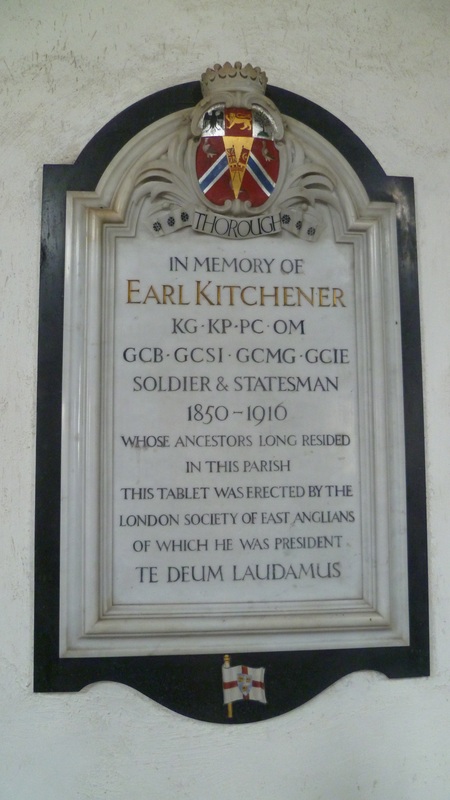 Use of the flag by this body, whose remit covered the four recognised East Anglian counties, was particularly apt. although the evident colours of this device are difficult to determine; what might have been a blue shield at the centre seems sadly much faded by the elements, whilst the surrounding colour does seems to be red but may conceivably be a rusty patina. 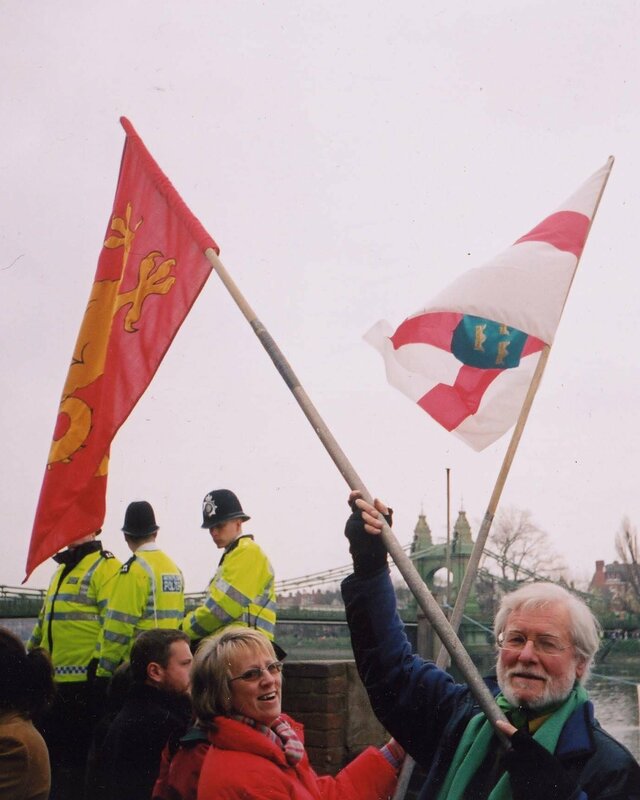 One example of the flag’s use was in 2004 where it was raised by a supporter of the Cambridge University boat crew during the famous race along the River Thames, Cambridge University lying within the bounds of East Anglia. 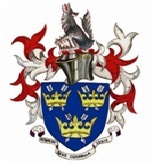 Here it is seen wielded alongside the flag of Wessex, in which regional territory, some hold, Oxford University is situated. 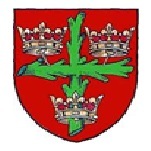 The same three crowns are also seen on the flag of Cambridgeshire, which, as stated, lies within East Anglia.